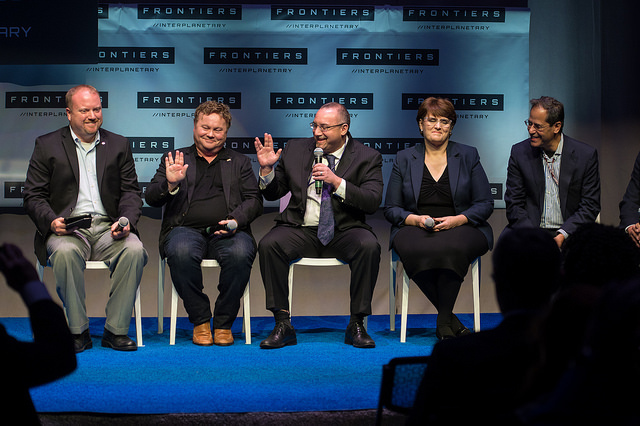 Yesterday I spoke at the White House Frontiers Conference hosted by President Obama. The theme of the event was this nation’s capabilities to continue to lead in key frontiers of science and knowledge. The frontier tracks were focused on 1) Personal; 2) Local; 3) National; 4) Global and 5) Interplanetary. Yeah, I spoke at the Interplanetary. Even at the end of a president’s term in office? We are on a cusp of a new chapter in our exploration of space. This new chapter is not about geographical goals nor about a specific program. Rather, it is about how America will explore space and how America will use the frontier of space to better our lives and we as a species. For the first time, a president of the United States endorsed a philosophy of space exploration, that more and more of our efforts will be commercially based with reliance on a new generation of commercial space companies. That the U.S. government will act as a customer. That the private sector will take on more of the financial risk. And that the creativity and imagination of the private sector will be a driving force for the American space effort, whether for colonies on the Moon, expeditions to Mars or commercial space stations. The flurry of powerful activities and media products, from the workshop attended by the president, to a CNN blog written by Obama, all matter. For too long we have undertaken space activities with one hand tied behind our backs, by denying that free markets, capitalism and entrepreneurism all have a role in space exploration. NanoRacks was founded just seven years ago on the premise that NASA was changing to allow a private company to offer services onboard the International Space Station. Today we are 50+ strong, with offices in Houston, Washington, DC and Silicon Valley. We have self-invested tens of millions of dollars in space station hardware owned by us, operated in cooperation with NASA. We have deployed over 140 small satellites from the space station for both smaller companies and for governments around the world. Our customer base also includes biopharma research organizations, high schools, universities and other space agencies. This is the new frontier of space. A place where operations in space are conducted just like business on the earth. The president also highlighted the NASA NextSTEPS program, where six companies have been selected by the space agency to explore develop commercial habitats from low-earth orbit to Mars. NanoRacks is one of those six companies. How cool is that? We, working together with NASA, have already taken the first steps. Now we are ready to take the next steps—where private companies like NanoRacks and others, design, operate and market to customers privately owned homes and factories in space. It was great seeing friends and colleagues at the White House workshop. There was a feeling of celebration, to mark how far we have come and a sense that the next decade will be a great decade for the private exploration and utilization of space. Let’s go!